Observer communicating system for full function and efficiency capability, Wi-Fi® remote access convenience, and intelligent diagnostics. 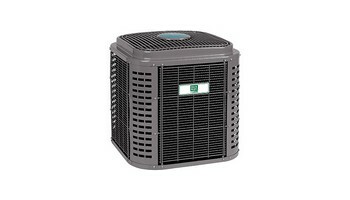 Also works as 2-stage unit with standard 2-stage thermostat Non-ozone depleting R-410A refrigerant Cooling capacity: 2–5 tons Constant Comfort™ Deluxe 17 Two-Stage Central Air Conditioner Hot weather is no match for our high efficiency air conditioner with a two-stage compressor that quietly delivers enhanced comfort and better levels of humidity control. Pair it with a complete Observer®communicating system, including the Observer communicating wall control with Wi-Fi® capability, for the convenience of remote access along with improved energy-saving performance and comfort management. Constant Comfort™ Deluxe 19 Two-Stage Central Air Conditioner Beat the heat with our highest-efficiency air conditioner featuring a two-stage compressor and variable-speed fan that quietly delivers optimum comfort and better levels of humidity control with up to 19 SEER. Pair it with a complete Observer® communicating system, including the Observer communicating wall control with Wi-Fi® capability, for the convenience of remote access along with improved energy-saving performance and comfort management.